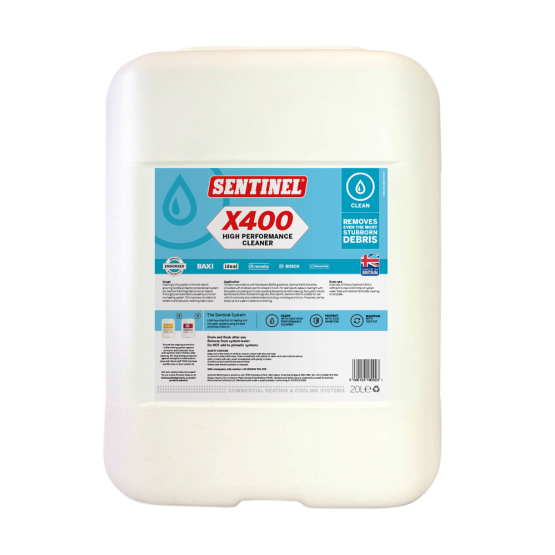 Sentinel X400 High Performance Cleaner is specifically designed for cleaning older central heating systems. It is a non-acid treatment which restores circulation to radiators and pipework. 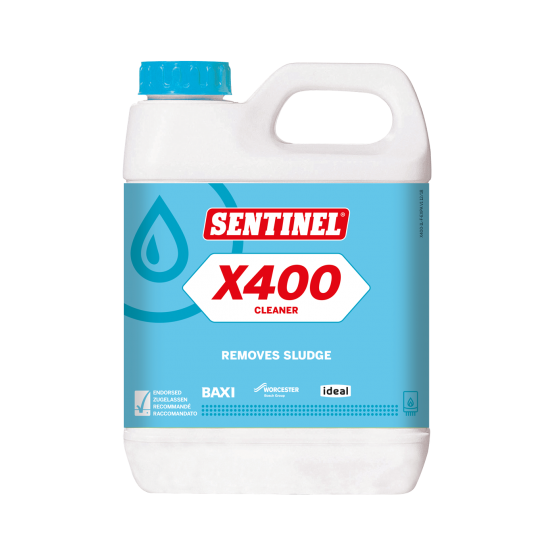 Its ruthlessly efficient formula shifts built-up magnetite sludge, eliminating cold spots in radiators and restoring proper heat distribution. Designed to make dosing in to the system quicker than ever. More information about Rapid-Dose and how to dose is available here. 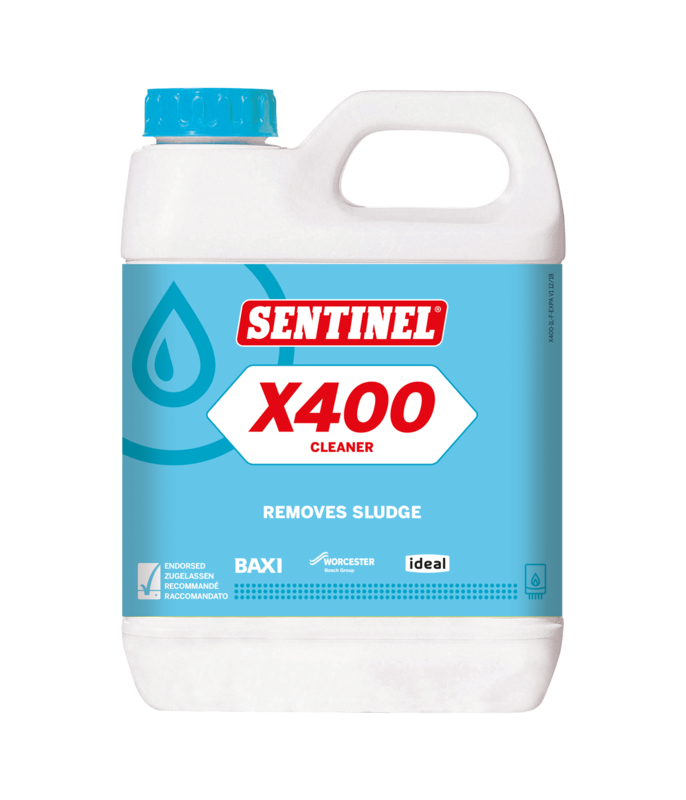 Sentinel X400 High Performance Cleaner restores a more even heat distribution to the house, keeping the property warmer and bills lower. Reviving an old heating system is a more cost-effective way to return warmth to a property than the installation of a whole new system. Cleaning an old system before installing a new component also prolongs the effective life of the new component, whether a radiator or a boiler, reducing maintenance and replacement costs. Best practice, derived from documentation such as the UK Building Regulations Part L Domestic Heating Compliance Guide, is that a central heating system should be thoroughly cleaned and flushed out before the installation of a new boiler. We advise that systems should be cleaned in accordance with BS 7593. 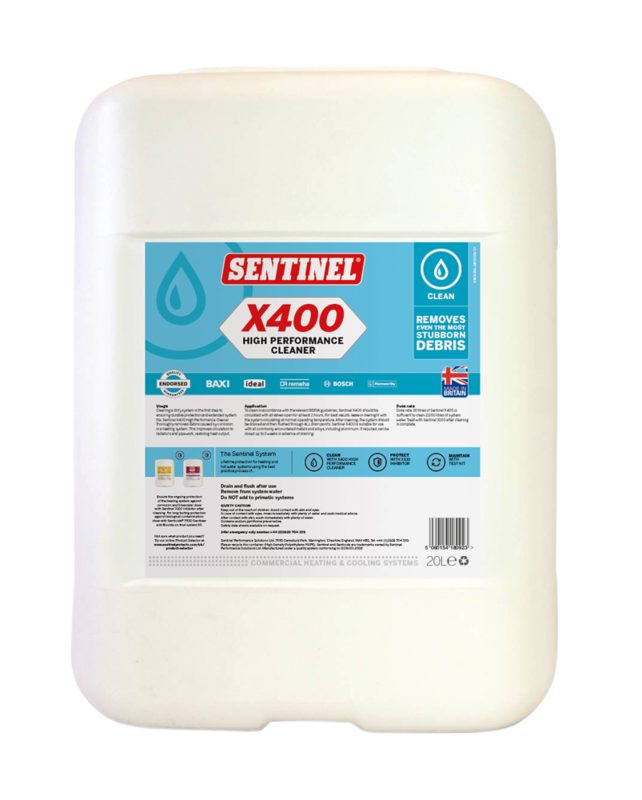 1 litre, 1 400ml aerosol or 1 275ml tube of Sentinel X400 High Performance Cleaner is sufficient to treat a typical domestic system of up to 10 radiators. Larger systems should be dosed with twice this amount. To clean an older system in accordance with BS 7593, this product should be circulated (preferably at normal operating temperature, with all valves open and the pump turned to maximum flow) for a minimum period of 2 hours or until satisfactory performance is restored. Use in conjunction with a powerflushing device to achieve a more rapid clean. Where systems are badly fouled, we recommend a longer circulation period (approximately 3-4 weeks). The product is not aggressive and can be safely left in the system for extended periods. This product will not clear a completely blocked pipe. Dose liquid via F&E cistern, via a by-pass feeder or use a Sentinel Dosing Vessel. For details of how to dose using the Rapid-Dose format of this product, please watch the Rapid-Dose video. When using concentrate gel, add directly to the heating system either via a radiator air bleed valve, or via the fill loop using the appropriate adaptor and a suitable caulk gun. 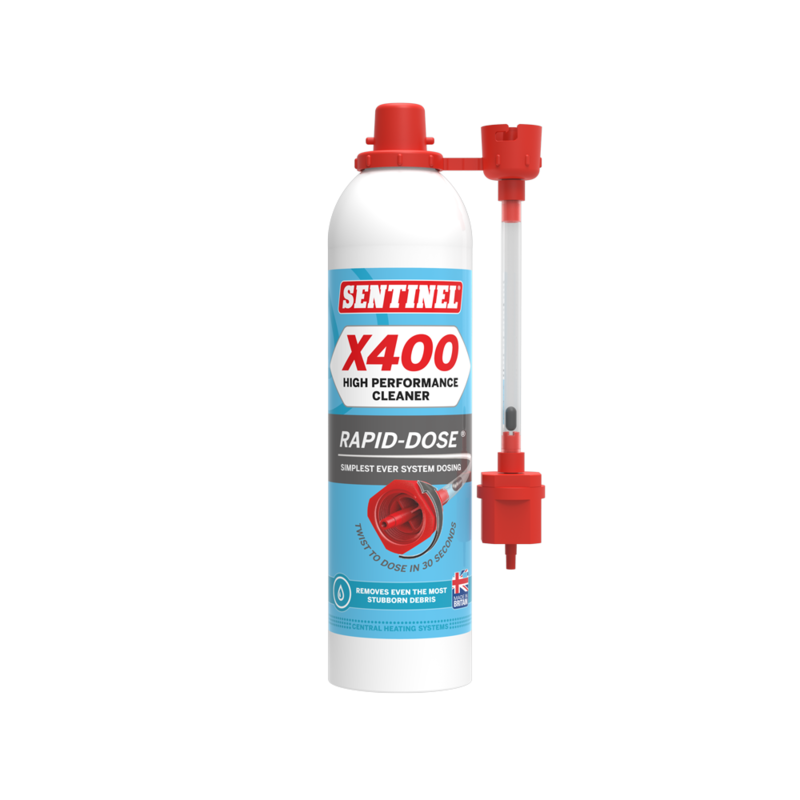 Can Rapid-Dose™ be dosed into the Eliminator filter range? 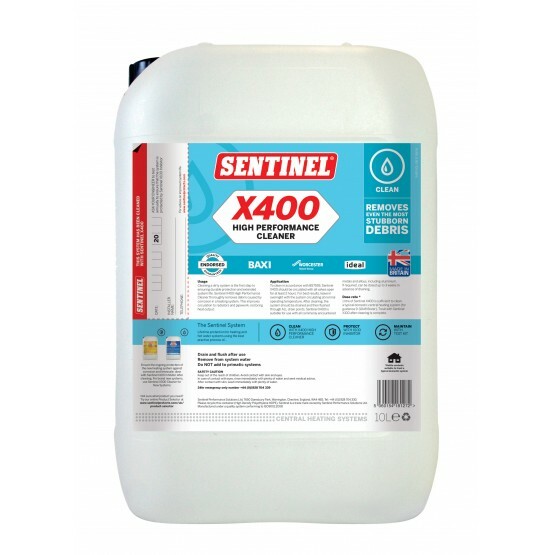 Can Sentinel X400 High Performance Cleaner be used in systems with aluminium components? Does the position of a Rapid-Dose™ can matter during dosing? How do I know what the pressure of the heating system is? How do I store a Rapid-Dose™ can when not in use? I have connected the Rapid-Dose™ adaptor to the system and opened the valve and water is coming out from the end of the adaptor. What do I do? The adaptor is broken or missing from my can of Rapid-Dose™, what should I do? 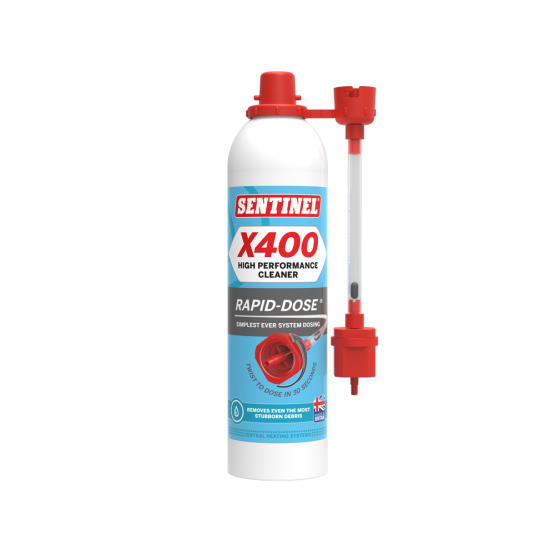 The new Rapid-Dose™ can is smaller than the old can, what does this mean for the heating system? What happens if I don’t open the stop valve before I discharge Rapid-Dose™? 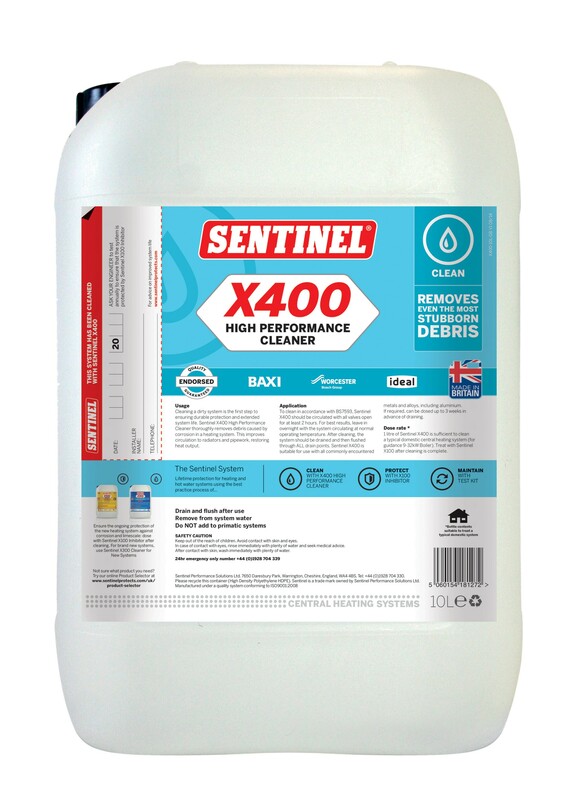 What problem does Sentinel X400 High Performance Cleaner address? What products are available in Rapid-Dose™ format? Why can’t I dose Rapid-Dose™ into the filling loop hose like I can with the old product?